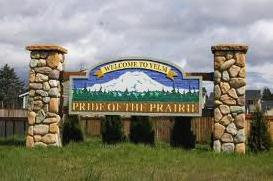 Yelm is located an equal distance between Olympia and Joint Base Lewis-McChord. This is small-town living at its finest, mom-and-pop restaurants and shops are spread throughout this quaint city, and any moment you could turn a corner and see Mt. Rainier staring back at you.